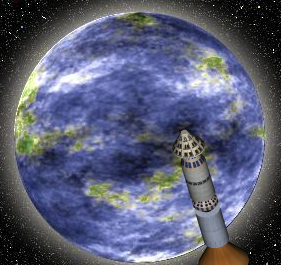 Future and Cosmos: Does the Earth Have an Optimal Distribution of Fossil Fuels? Does the Earth Have an Optimal Distribution of Fossil Fuels? When speaking about global warming, people sometimes talk about fossil fuel reserves as a kind of great threat to us that we must resist fully using, or else face ruinous consequences. Some say that we have what is called a carbon budget that we must stick to, to avoid a future temperature rise greater than 2 degrees Celsius. The carbon budget has been described as being no more than 1500 gigatons of carbon dioxide that can be expended before the year 2050. Presumably a higher budget would be allowed for the period up until 2075 and the period up until 2100. It is argued that we must use great restraint in limiting ourselves to this carbon budget, rather like some person who can take some morphine pills, but who must restrain himself from taking too many, lest he die from an overdose. But there is actually a reason for believing the chance of a carbon dioxide “lethal overdose” is low, and perhaps nonexistent. The reason has to do with the extent and nature of fossil fuel reserves. For one thing, there are not unlimited amounts of coal, oil, and natural gas lying about. The oil reserves of the top 15 oil producers is only about 1540 billion barrels, which is about 50 years of current global oil use, and considerably smaller than that if we allow for future population growth and economic growth. Some are worried that we may soon hit the “Peak Oil” point that has long been predicted. Although it is claimed that coal reserves are sufficient to last for 153 years of global production, many think that we will hit “Peak Coal” within a few decades. What is called a resource pyramid is one of the reasons why both coal and oil production may decline within a few decades. 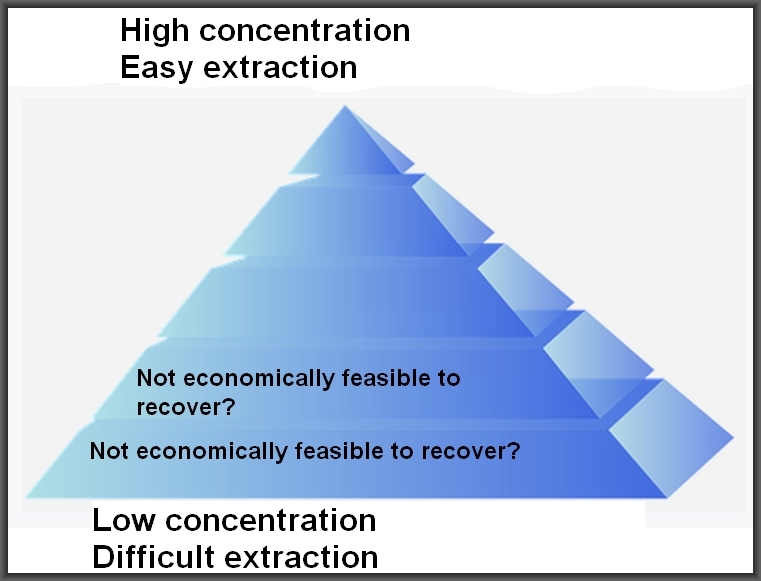 As shown below, the resource pyramid is the concept that the easiest coal and oil resources to extract are found in the smallest amounts. The resources that are found in the greatest amounts are those which are hardest to extract. Because coal and oil resources are arranged in a kind of resource pyramid, with most of the resources being very hard to extract, it is quite possible that there is almost no chance that mankind will “overdose” on carbon resources. 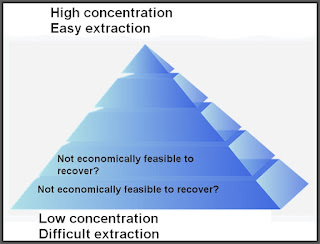 By around the middle of the century, we may find it harder and harder to extract coal and oil resources, as we work our way deep down the resource pyramid of oil and the resource pyramid of coal. The very distribution of these resources may put a brake on runaway consumption, forcing humanity to reduce consumption and switch more to alternate energy sources such as solar and wind. David Rutledge of Cal Tech has predicted that by 2069 the world will have produced 90% of the coal that it will ever produce. If something like that happens, the worst projections of the IPCC will not occur, and the world's temperature will probably never rise much higher than 2 degrees Centigrade above its current level. These facts bring to mind a very interesting question that has rarely been considered: what would be the optimal distribution of fossil fuels that our planet might have had? And also: is it possible that the earth's actual distribution of fossil fuels is something close to an optimal distribution? First, let us consider some distributions of fossil fuels that would not have been optimal. One distribution we can imagine is one in which our planet simply had no fossil fuels at all: no coal, no oil, and no natural gas. In such a case there would have been no modern civilization of the type we have enjoyed for the past 100 years or so. That obviously would not have been an optimal distribution of fossil fuels. Another distribution of fossil fuels we can imagine is one in which oil and coal started to run out at a time such as about 1980. That also would not have been an optimal distribution of fossil fuels. We can also imagine a distribution of fossil fuels in which coal and oil resources were two or three times higher than our planet has, with two or three times more easily accessible resources. In that case there might have been a much higher chance of catastrophic global warming caused by excessive use of fossil fuel resources. Instead of any of these possibilities, what we may have on our planet is pretty much an optimal distribution of fossil fuels. The fossil fuels we have are enough to last us until the cost of alternate energy sources such as solar power and wind power falls down so low that such things (possibly assisted by nuclear fusion) can serve as replacements for fossil fuels. But existing as they are in a resource pyramid, the fossil fuels we have may be distributed in such a way so that the easily accessible resources start to gradually run out just at about the time that we will need for them to run out, so that we don't overheat the planet by burning too much carbon. At just about the best time for such a message, nature will in effect start telling us, “It's time to switch away from fossil fuels -- I'm going to slowly make it harder and harder for you to get them.” And nature will start delivering that message in a louder and louder voice over the span of several decades. We will get this message from nature pretty much at just the right time -- all because fossil fuels just happened to be distributed in a particular way that may turn out to be very lucky for us. If we have such a nearly optimal distribution of fossil fuels, we may wonder whether that is an improbable lucky coincidence, or something that was set up in advance for our benefit.